Photo Caption: Germany's Marcus Ehning, winner of today's ninth leg of the 2010/2011 Rolex FEI World Cup™ Jumping series in Zurich, Switzerland is presented with a Rolex watch by Mr Pedro Reiser, Market Manager Rolex Switzerland. Photo: Katja Stuppia/FEI. 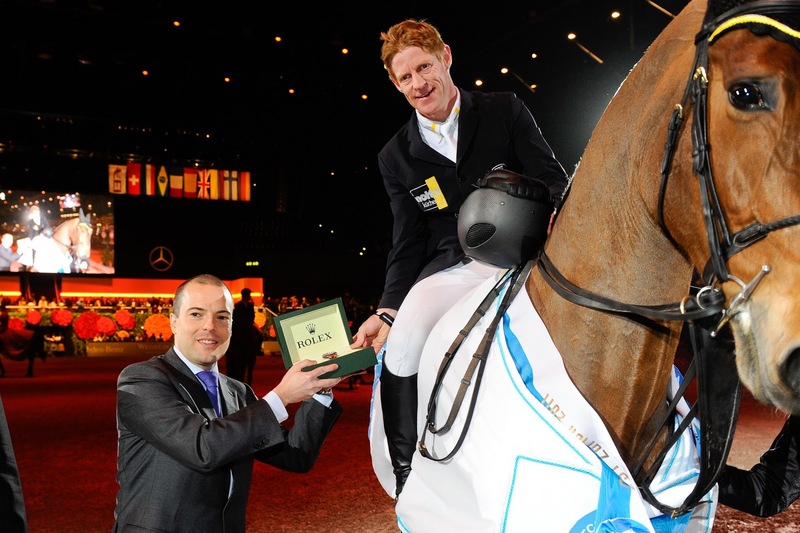 Marcus Ehning brought the German tally to five wins in the 2010/2011 Rolex FEI World Cup™ Jumping series with a convincing victory riding Noltes Kuchengirl at the ninth leg in Zurich, Switzerland today. In an exciting seven-way jump-off against the clock, the defending champion pipped British birthday boy, 28 year old Ben Maher riding the rejunevated Robin Hood W, while Australia's Edwina Alexander and Cevo Itot du Chateau finished third. Remarkably, two Spanish riders made the cut into the jump-off and the first of these, Pilar Cordon, slotted into fourth when double-clear with Nuage Bleu while German superstars Meredith Michaels-Beerbaum and Shutterfly had to settle for fifth with a single mistake against the clock. Today's result however has promoted Michaels-Beerbaum to runner-up spot in the Western European League standings which continue to be led by World No. 1 Kevin Staut from France whose first-round double-error proved costly today. Course designer, Frank Rothenberger, set them the toughest of tasks with a big, bold track that demanded courageous jumping and plenty of scope. However as always luck played its part too as, in particular, the planks at the triple combination chose to defy gravity in many cases while also claiming a large number of victims. The 12-fence course was unrelenting from the outset, and even the spread on the opening oxer took its toll. Rothenberger set testing distances all the way around the arena, and most of the 39 starters opted for a forward five strides from the oxer at fence five to the following liverpool oxer at six. However the latter came up on a long distance for Austrian legend Hugo Simon - the first-ever winner of the Rolex FEI World Cup™ Jumping trophy back in 1979 and one of just four riders to claim the series title on three occasions - and he was dislodged from the saddle when his mare, Ukinda, produced a huge leap. Amused however, rather than annoyed and disappointed, the 68 year old rider left the ring with a broad smile on his face. And he wasn't alone when leaving the field of play on foot as Norway's Nina Braaten, who is 40 years his junior, also parted company with her ride Blue Loyd at the triple combination which took a heavy toll throughout the competition. This was a real test of judgement and control, approached on a tight three-stride distance from the previous vertical at fence seven and fronted by planks at both the first and third elements. Time and again it was lowered, and Braaten's fate was sealed by an unbalanced approach which left her with a big stand-off at the second element and on her feet as she tumbled into the third. Despite all the drama however, seven made it into the jump-off against the clock with five nations represented in the final showdown including two from both Spain and Germany. Switzerland's Janika Sprunger led the way with the 10 year old uptown Boy but with eight faults collected at the oxer at fence six - now the third fence on the new course - and at the following vertical at seven she left the door wide open for the rest. Spain's Pilar Lucrecia Cordon has proven many times before that she can cut it with the best of them, particularly when partnering her handsome stallion Herald, and steered the 10 year old Nuage Bleu home to record the first clear of the course in 42.81 seconds. Next to go was one of the favourites, Michaels-Beerbaum with the great Shutterfly who had made the first track look very elementary indeed. But one of the dreaded planks that had caused so much heart-ache in the opening round was still standing and when the 18 year old gelding hit that for four faults then it was still all to play for. Sergio Moya then set off for Spain with the Action-Breaker and was looking very good indeed until turning to the double at fence nine which was now just three fences from home. Their round fell apart when their take-off was a good deal too early here and they finished with eight faults in 44.70 seconds so the result was, yet again, clearly hanging in the balance. Ehning's round that followed however was cool, smooth and careful as Noltes Kuchengirl cruised home to re-set the parameters when breaking the beam in 40.03 seconds. Edwina Alexander and Itot du Chateau were quick and clean when second-last to go, but despite a great turn from the penultimate wall - a new fence introduced for the timed round - the Australian partnership were more than two seconds off Ehning's target, leaving it all up to last-man-in Maher. The British rider could have been forgiven for holding back with the 13 year old Robin Hood who has only recently returned to action after a long layoff but he wasn't at all fazed. "Today's course was one of the biggest Grand Prix tracks I've seen for a long while and it played to my horse's advantage because that's the way he likes it" Maher said afterwards, and he was clearly giving it his best shot when racing through the finish to slot into second spot in a time of 42.10. Winning rider Ehning agreed with Maher's analysis. "This was a very good World Cup competition. The course was quite big but nice to ride and I really liked it!' he said with some satisfaction. He described the test set by Rothenberger at the triple combination as "clever - this was not a normal line because there were three strides from the vertical before to the triple and then just one stride inside the triple - it wasn't easy - normally we would have more strides before the first part of the triple which was big to jump anyway" he pointed out. Maher explained that Robin Hood's absence from the ring came about because he was off form last summer, then didn't go to Kentucky for the Alltech FEI World Equestrian Games™ and so got a long break. "He was never lame" Maher said," but he wasn't happy and the vets decided he needed two months break mentally, so I went with that because he's too good a horse not to give him every chance. The plan had been to go to the WEG but when the team was picked I was one of six and only on the edge, and my other horses were injured so it was very short notice for him and it didn't happen. So then we decided to give him a longer break and he's come back in flying form now" said the rider who is currently dividing his time between the Western European League and the Florida circuit. His next appearance in the Western European League of the Rolex FEI World Cup™ jumping series is expected to be at Gothenburg, Sweden in February. Edwina Alexander said that her game little Itot du Chateau "wanted to win!" and described today's class at the Mercedes CSI in Zurich as a super competition. "I didn't see Marcus go but I saw Meredith - I know Marcus is always fast. I didn't get the best sweep to the second fence and the double of oxers and it didn't feel fast, but my horse is in super shape and that's important. I plan to do the rest of the World Cup qualifiers, but I won't take Itot to the final in Leipzig" she pointed out. She admitted she still has "a bit to do" to get there as she is only carrying 26 points at this stage in the series with just four qualifying rounds remaining. Normally riders need about 40 points to ensure they book their place. The heat is on now as the series heads for Bordeaux, France next Saturday and then Vigo in Spain and Gothenburg, Sweden later in February before the final qualifying opportunity takes place in 's-Hertogenbosch, The Netherlands in March. But the host nation of Germany is looking stronger than ever, with Ehning's result today bringing their record to five wins from nine qualifiers so far this season. For further information on the ninth leg of the 2010/2011 Rolex FEI World Cup™ Jumping series go to website www.mercedes-csi.ch or contact Press Officer Roman Gasser, Email rgasser@viva.ch or Tel +41 79290 4872 or + 41 79 635 5005. The next leg of the series takes place in Bordeaux, France on Saturday 5 February 2011. For all information on the French fixture go to website www.jumping-bordeaux.com or contact Press Officer Marie-Sol Fournier at Email presse@bordeaux-expo.com or Tel: +33 556 11 99 43. 2 riders eliminated for falls in first round - Austria's Hugo Simon (Ukinda), Norway's Nina Braaten (Blue Lloyd). German riders have now won 5 of the first nine qualifying rounds in the Rolex FEI World Cup™ Jumping Western European League series. There are 4 further qualifying legs - at Bordeaux (FRA), Vigo, (ESP), Gothenburg (SWE) and 's-Hertogenbosch (NED) before the final which takes place in Leipzig, Germany from 27 April to 1 May. 11,500 spectators attended today's event at Zurich. Great Britain's Ben Maher - when asked why he didn't react as the crowd sang "Happy Birthday" for him at the end of his first round - "it wasn't that I didn't appreciate it - I was worried I could end up on the ground! Robin Hood is not a sociable horse and he doesn't like noises in the ring or anything like that - I knew if I relaxed for a second after I finished my round I could end up on the floor because he's done it before so i was just concentrating on getting out of the ring in one piece!" John Roche, FEI Director Jumping - "We enjoyed fantastic sport today. I would like to congratulate Zurich on a fantastic event, it is one of the crown jewels in the FEI World Cup Western European League, and I'd like to thank Rolex, Mercedes and all the other sponsors that make this possible". Ben Maher - "this is one of my favourite shows - I always look forward to coming here"
Edwina Alexander, Australia - "I won the Mercedes Classic in 2008. Zurich is always big and today was very well built by Frank. It was a careful course and the double of oxers was quite difficult, the combination was quite delicate".